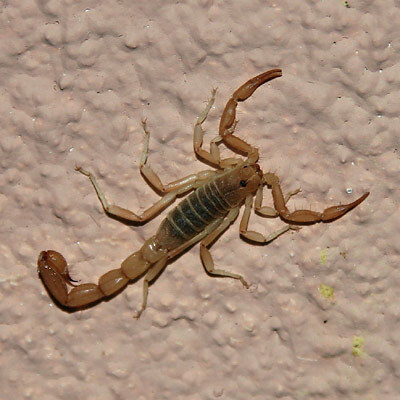 When summer arrives here in Tucson, Arizona Scorpions (Order Scorpiones) emerge to hunt insects and spiders after dark. During the day, Scorpions hide in dark places, and woodpiles are one of their favorite hiding places. Given that Black Widow Spiders and rattlesnakes also like to hide in woodpiles, it's best to be extremely cautious around them. Most people here in Tucson put their woodpiles up on metal racks well above the ground to help keep out most of the creepy crawlers. Scorpions are arachnids like spiders (and they are most definitely included in my arachnophobia). Scorpions have lobster-like claws that they use for grasping prey and a sharp spine on their tail that they use to inject poison into their prey or any perceived predators (like humans). The stings of some Scorpion species can be fatal in small children, but this is very rare, and most scorpion stings are merely painful. The very first night that I spent here in Tucson was on an air mattress on the floor because my furniture had not yet arrived. In the middle of the night, I felt things biting me on the legs. I got up, turned on the light, threw back the sheet, and was horrified to see dozens of red ants walking across my bed. I was even more horrified when I noticed that the biting ants were not alone, there was also a Scorpion in my bed. I was then quite grateful to the obnoxious ants for waking me up, but that didn't stop me from getting out the ant spray. I have never and would never sleep on the floor here in Tucson again after that first night.